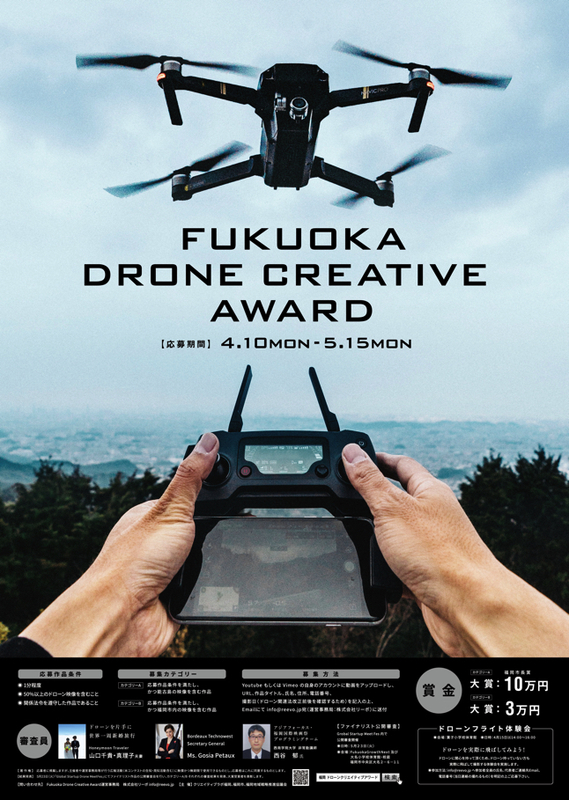 As a way of ushering in the drone as a familiar instrument in the creative arts, and in the interest of discovering brand new talent, we are holding a contest to find the best drone-captured video. We await submissions that represent a works of art which truly allow one to discover or rediscover the wonders of Fukuoka. Please upload your video to your own Youtube or Vimeo account, then send an email to info@reevo.jp including the URL, video title, your name, address, phone number, and capture date (to confirm whether it was before or after the drone-related law revisions). ・The time and date of creation is not relevant. ・A single applicant may submit any number of creations. ・Please agree to the following terms and conditions before making your submission. All submissions will be treated as having been submitted under agreement to the terms and conditions. ・All individuals under 18 years of age should obtain permission from their parent or guardian before submitting. All submissions will be treated as having obtained permission from the applicant’s parent or guardian. Please read the following terms carefully before making your submission. ・All laws and ordinances regarding drone flight must be adhered to in obtaining one’s submission. ・Submitted works must not infringe on the rights of a third party, such as by slander or copyright violation, and all works that are in violation of this condition will not be disqualified from the contest. In the event of an issue related to the infringement of rights, all shall be settled at the responsibility and expense of the applicant. ・Please note that each applicant’s submission may be displayed to the public through printing, video screening, etc., for not-for-profit publicity activities contributing to PR for the city of Fukuoka (including advertising campaigns and publicization of this contest) by the sponsor of this event or by a third party recognized by the sponsor. ・Please note that we are not able to respond to any inquiries regarding the judging process. ・Submissions may be duplicated for entry into other contests. Works submitted to contests which restrict duplicate submissions, works for which the applicant has transferred copyright or a license agreement to the organizer of the contest or a third party, and works for which the contest organizer or a third party has specified transfer of copyright or a license agreement as a requirement may not be submitted. ・A small number of exceptional works will be selected through an executive screening process. The finalists will be announced on our homepage. How to participate: Please send an email to info@reevo.jp which clearly lists the names of all participants, a representative email for your party, and your telephone number (one with which we can reach you on the day of the event).